Interview With Jeremy Burnham (Children Of The Stones, 1977). Alongside Trevor Ray, Jeremy Burnham co-created the fantastical Folk Horror drama, Children Of The Stones (1977). Now considered a key text in 1970s Folk Horror and possibly one of the scariest programs ever conceived for children, I caught up with Jeremy to ask him about the ideas behind the show, the process of filming it and its subsequent novelisation. Where did the initial ideas for Children Of The Stones emerge from? Trevor and I used to live not far from each other in North London, and we sometimes met for coffee to throw ideas around. We knew each other because he was the script editor for ‘Paul Temple’, and I had contributed several episodes. What was the writing process like between yourself and Trevor Ray? The writing processes for the TV scripts and the book were different. We had to pick our way carefully through the former. But by the time we came to write the book we knew the story, so one of us – I forget which – wrote the first half, and the other the second half. What was the process of filming and writing a series like Children of the Stones like in the 1970s? Was there anything that came up in the story because of the process of writing and filming? I don’t remember anything that came up in the filming that altered anything. But I remember our research visit to Avebury before we started writing – we always knew it had to be Avebury – and seeing a large crow alighting on the back of a ram, after which both of them remained motionless. We knew then that this was the sort of place where strange things happen. Did you attend any of the filming sessions in Avebury? If so, did the location add detail or any particular elements to the story that may not have been there if filmed somewhere else? Yes, I visited the location several times during filming because my wife Veronica Strong was playing Margaret. As the whole story was based on the Avebury Ring, we followed both the geography and history of the village, which meant that the incomplete stone circle had to be completed with false ones. Veronica told me that some Japanese tourists who were watching the filming stared open-mouthed as a member of the crew picked up one of the false ones and carried it away. 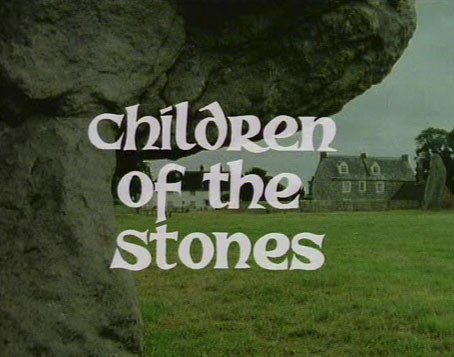 There appears to be several themes reoccurring in Children of the Stones; chiefly the connection between the ancient and otherworldly. Were these ties that you brought together yourself or were they inspired by elements from elsewhere? The elements of the story were brought together ourselves. One of the important ones came from a book called ‘The Old Straight Track’ by Alfred Watkins, all bout Leylines. Do you have any particular memories of working on Children Of The Stones as a series? I remember something that happened soon after the serial aired: Veronica was appearing in a play called ‘Habeas Corpus’ by Alan Bennett in Israel. The British ambassador was in the audience and, having read in the programme that she was married to me, came round afterwards. He told her that his children had been watching the serial – but they’d had to leave the UK before the last episode. They were desperate to know how it ended, and if she could provide the information he offered to give us lunch at the Athenaeum. So that’s what happened – he bought us both lunch, and we gave him an autographed copy of the book. What was the process and differences between Children Of The Stones as a series and as a novel? Was there anything you would have liked to have included in the former that was achievable in the latter? No, the only difference was that writing the book was much easier, because we knew where we were going – whereas writing for the serial was a question of picking our way through the dark. You’ve penned a novelised sequel in the form of Return To The Stones. Where did the ideas for writing a sequel to Children Of The Stones come from? Would you like to see it adapted for television itself at some point in the future? We discussed the possibility of a sequel many years ago – we even started writing it. But we hadn’t got very far before we had an amicable disagreement about which way it should go. So Trevor relinquished all his rights in the characters and story to me. He approved of the result, I’m glad to say. I certainly would like to adapt it for television, and we’ve recently had two offers to do exactly that, together with a re-make of ‘Children’. Unfortunately, we are now in dispute with ITV about the rights. Meanwhile some mad American wants to turn the first book into an opera! The Television series in particular is now considered one of the high points in the movement of folk horror. Were you aware of a general popularity in the incorporation of themes of folklore into fantasy (for example, the man crushed by a stone being derived from genuine folklore and history) during this period or was it something that was a natural interest to you originally? Yes, we were aware of the folklore/fantasy genre, but we wouldn’t have put a name to it. We used genuine stuff about Avebury that we found out through research – like the barber-surgeon being crushed by one of the stones – to put in the melting pot. But that was serendipity, rather than a conscious desire to write a ‘folk/horror story’. Jeremy Burnham’s official website can be found here. He is currently working on a one-man show about the poet, A.E. Housman which is performing at the Frome Festival on the 12th of July. Excellent interview, thank you! I know several people who became archaeologists after watching this show as children. Scary and inspiring. Children Of The Stones was the most atmospheric programme I ever saw and influenced my life in so many ways. A truly great show. I now work in the media industry and would love to produce a remake. Death and Landscape in Drowning By Numbers (1988) – Peter Greenaway. Valerie And Her Week Of Wonders (1970) – Duality Through Sound And Vision (Part 2).